Fig 1: The two original 25mm Masuyamas with the new 26mm Masuyama (note the retention of smooth barrels). Fig 3: The stylized text engraved in the eyepiece housing remains the same (left-original, right-new). Both the original and newest generation of Masuyamas shows a nice fit, finish, and build that feels solid and of high quality. The distinctive stylized script of the Masuyama name is retained as is the thin red stripe on the housing. One of the distinctive features of the original Masuyama design was also the flared grip panel at the bottom of the housing -- it gave the line a very distinctive appearance. Oddly, this feature is only present on some of the newer generation models (80mm, 60mm, 50mm, 45mm). On these models, this extended grip panel can be removed if desired. (left-to-right: 25mm 52°, 25mm 65°, 26mm 85°). Another feature of the original line was the eye guard being formed out of the eyepiece metal housing itself and incorporating an eye lens baffle as well. This top eye lens feature also unscrewed allowing better access to the eye lens for cleaning or disassembly as it revealed the top retaining ring. While odd by today’s standards, I found this design actually more effective than the typical rubber eye guard common today, providing more effective shielding from extraneous light than I am used to with the common foldable rubber eye guards. The new generation of Masuyamas incorporate a standard medium thickness rubber eye guard for protection from extraneous light as well as protection against scratching eye glasses. It is both foldable and removable. Overall, these newest Masuyamas show a build typical of higher quality eyepieces. Fig 5: Internal barrel blackening (left-to-right: 25mm 52°, 25mm 65°, 26mm 82°). Examining the inside of the barrels revealed nicely appointed blacking of all visible surfaces. The blackening on the original versions however appeared both slightly flatter and slightly thicker or more uniform in its application. Also of note is the absence of the dreaded undercut on both the original and newest generation of Masuyamas – a modern element that is more of a nuisance than a feature. Note that regardless of the exact design of the undercut, they all have a propensity to snag when extracting from focusers and can even prevent square seating of the eyepiece to the focuser/diagonal if the compression ring is not engaged exactly within the undercut. both have similar true fields of view (TFOV). For those observers who are concerned about weight or generally do not like overly large eyepieces, the new generation 26mm Masuyama is a godsend as it is quite diminutive for a 2” eyepiece with such a large AFOV. Next to the Pentax 30XW, which shows about 1/10° less true field of view (TFOV) than the 26mm 85° Masuyama, the Masuyama is significantly smaller and lighter. Observational testing was conducted in a rural location west of Fredericksburg, VA; a Yellow Zone where the Milky Way is nicely defined across the sky during Moonless nights. The eyepieces were tested with a Takahashi TSA-102 f/8 triplet Super Apochromat refractor, a 6" APM/Lunt 152 f/7.9 ED-Apochromat refractor, and a 10" Company Seven certified Orion XT10 f/4.7 Dobsonian reflector equipped with a Tele Vue Type I adjustable top Paracorr. Testing took place during numerous observing sessions encompassing several months. 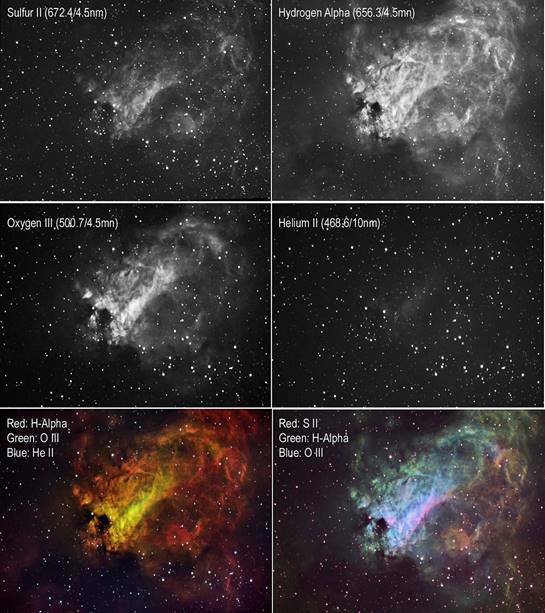 Fig 7: M17; Swan Nebula (Narrow Band Color). Credit:Dean Salman & the ESA/ESO/NASA Photoshop FITS Liberator. Celestial objects viewed included: the open cluster M7, the Lagoon Nebula M8, the Swan Nebula M17, the Triffid M20, the globular clusters M22 and M28, the Ring Nebula M57, the colorful double star Albiero, and the bright star Vega. For the testing my primary areas of focus were off-axis star point performance, and then how bright and richly the perceived contrast was of the various celestial objects viewed. Note that I said “bright” instead of transmission and “perceived contrast” instead of simply contrast. I choose those words since our perception of brightness can be due to multiple optical factors, not just transmission, and for contrast it is even more complicated as our perception system may register the view as higher contrast when in reality it is not. So the assessment was more of which performed visibly best at portraying the targets at hand richly and brightly and with the most details, which ultimately is more important than the individual factors like transmission, contrast, others that cannot really be singled out or quantified without test bench equipment. My first concern when taking the eyepieces out for their initial assessments was off-axis performance. For this I used several bright stars, including Vega, since they would reveal issues more readily. I also included my Explore Scientific 24mm ES 68° as a common reference eyepiece. 24mm ES 68° – Tight star points for bright stars over 95% of the field of view (FOV); Minimal astigmatism right at the field stop. Off-axis performance was not very sensitive to eye placement over the exit pupil, so it was quite forgiving. 26mm Masuyama 85° -- Tight star points for bright stars across 75% of the FOV, with a minor amount of astigmatism showing between 50%-75% from center. At about 80% from center the astigmatism grew to moderate levels that were noticeable and distracting even when peripherally viewed. Off-axis performance was quite sensitive to eye placement over the exit pupil, so it was important to maintain exact placement for best performance. 25mm Masuyama 65° -- Tight star points for bright stars across 75% of the FOV, with astigmatism becoming progressively moderate after that. While the astigmatism was moderate in that last quarter of the FOV, it was not unduly bothersome. 25mm Masuyama 52° -- Tight star points for bright stars across 75% of the FOV, with astigmatism becoming progressively moderate after that. While the astigmatism was moderate in that last quarter of the FOV, it was not unduly bothersome. And if the stars were dimmer, like the stars in the Double Cluster, they held well almost to the field stop. From an off-axis star point performance standpoint, the 24mm ES 68° was definitely the winner. Of the three Masuyamas the 52° version was the most disappointing given how comparatively small its Plossl-like AFOV was my expectation was that it would have performed better. The 85° Masuyama I felt was a little disappointing as the ES 68° put up tighter star points at the same TFOV position as same stars rendered in the Masuyama 85°. However, the larger contextual area of the Masuyama 85° was hard to overlook. In the end I was not able to determine which of the two I preferred better as both had definite strengths, just in different places. Over the course of testing and later just observing I would reach for either equally as both were enjoyable to use. 24mm ES 68° – Star points were perfect across the FOV. 26mm Masuyama 85° -- Tight star points across 50% of the FOV, with minor bloating of the star points starting past that. 75% from center astigmatism was moderate, noticeable, and distracting even when peripherally viewed. Like with the Apos, off-axis star point performance was very sensitive to good eye placement over the exit pupil; with good placement star points were acceptably tight across 65-75% of the FOV. 25mm Masuyama 65° -- Showed good star points to the edge of the field. However, it was very sensitive to good eye placement over the exit pupil and any deviation would result in poorer off-axis performance. In the Dob with Paracorr the FOV also darkened towards the field stop. This darkening did not occur in the Apos. Also, this eyepiece may not work well in Newtonians that do not have low profile focusers as with the Paracorr in place I had to bottom out the focuser to achieve focus. 25mm Masuyama 52° -- Showed good star points for bright stars to the 75% point, but also showed darkening and loss of brightness near the field stop like in the Masuyama 65°. Past the 75% point the astigmatism was noticeable and degraded the view beyond what I liked, for both bright and dim stars. As example, observing the Double Cluster in the XT10 with Paracorr, when one cluster was centered the other cluster near the field stop showed aberrated stars obscuring the cluster’s form. In the f/8 Apos though, placing one of these clusters near the field stop still showed the star points acceptably tight. So basically the Double Cluster looked beautiful in the f/8 Apos as there were no overly bright stars which tended to show less well when nearer the field stop. In the XT10 Dob with Paracorr however, the Double Cluster was not a very nice sight if either cluster was positioned in that outer 25% of the FOV since even dim stars did not show well. Overall, like in the Apos, I preferred either the 24mm ES 68° and the 26mm Masuyama 85° to the other eyepieces in the Dob. The larger contextual area of the Masuyama 85° was a definite advantage and made forgiving its off-axis performance possible. In the end, I was not able to determine which of the two I preferred better as both had definite strengths in differing observing situations. As far as how much scatter was seen, I observed both Saturn and Vega to assess this. The scatter levels I felt were typical for a good quality modern eyepiece in both the ES 68° and Masuyama 85°, both showing equal brightness and extent to their scatter. The Masuyama 65° showed less scatter, and the Masuyama 52° the least of all of them. 24mm ES 68° – Very slight. 26mm Masuyama 85° -- Very slight. 25mm Masuyama 65° -- None. 25mm Masuyama 52° -- Apparent but not bothersome. I was surprised to see that the smallest AFOV eyepiece had noticeable edge of field brightening. It definitely was apparent for me when observing dimmer targets like the Double Cluster. The Masuyama 65° however was inky black and uniform across the entire FOV. EOFB was very slight in the ES 68° and Masuyama 85°, with the ES 68° showing the least of the two. It was very minor in these two eyepieces and I would not have noticed it if I was not testing for it. Orange and red stars were observed in various clusters, and the gold and blue colors of Albiero were scrutinized for this test. I could see no discernable difference with any of the eyepieces so they all shows colors of stars with equal fidelity and saturation. This test, more than any other, was the most critical in my opinion. It is about how brightly and richly detailed the celestial objects are shown in the FOV of each eyepiece. It is what observing is all about as it is more of a gestalt of how all the aspects of the eyepiece come together to show you a celestial object. Overall, across all the target types, my favorites of the four eyepieces were the Masuyama 85° and Masuyama 65°. While the ES 68° was definitely the brightest of the four showing the various nebula and globular clusters observed as being both brighter and with greater extent, the two Masuyamas showed a level of perceived contrast, internal nebula details, and background FOV richness that made the celestial targets stand out more. As example, in both the Swan Nebula and the Triffid Nebula, dark lanes within and around these nebula were comparatively washed out in appearance in the ES 68°, but were richly and distinctly portrayed in the Masuyama 85° and Masuyama 65°. This made the observation of these objects much more visually impactful in these Masuyamas compared to the ES 68°. Turning to globular clusters, like M22 and M28, in the ES 68° their cores took on more of a milky appearance whereas in the Masuyama 85° and Masuyama 65° the cores were obviously granular with small glimmering diamond chip appearing stars readily visible across the disk. For open clusters, dimmest star points showed more distinctly with direct vision in all three Masuyamas. And between the 85° and 65° Masuyamas, both of which outperformed the Masuyama 52°, the 85° showed objects slightly superior in these aforementioned respects than the 65°, so the more modern incarnation of the Masuyama held the edge. 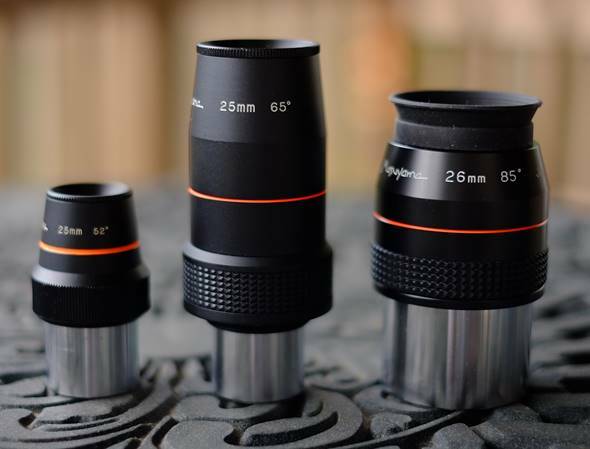 Finally, the Masuyama 52° took last place compared to the other eyepieces. All the extended objects like nebula and galaxies appeared quite a bit dimmer in this eyepiece compared to the others. It was quite surprising to me that for a same vintage eyepiece that the 52° performed so poorly in this respect to their 65° model. However, the rendering of clusters, both globular clusters and open clusters, the Masuyama 52° bested the ES 68° and my 25mm Sterling Plossl on these targets showing more granularity for globulars and showing the dimmest stars in open clusters more distinctly. In the many years I have been conducting eyepiece evaluations it is not unusual for an eyepiece to be better than another on some celestial object types, and worse on other celestial object types. What the optical drivers may be that causes this is anyone’s guess, but perhaps it might be the reduced scatter level observable in the Masuyama 52°; even though it showed extended objects less well, for star points which will generate a greater scatter profile it may be the factor allowing it to perform better here. This is of course all conjecture, as the only way to get to the root of the matter would be to have quantitative data from an extensive bench test on all the optical parameters for each eyepiece. Not having that we are only left to our best guesses. The modern incarnation of the Masuyama eyepieces seems to have carried forward their excellent reputation for providing high apparent contrast views. Indeed, for the globulars and nebula observed the Masuyama 85° quickly became my favorite during the testing, showing them brightly, richer in details than the other eyepieces, and with the largest contextual TFOV. While I would have liked its off-axis star point performance to be a little better like the longer focal length Masuyama 32mm 85° which I have previously used, the on-axis is where the action is in my opinion and carries the most importance for me. Given how distinctively better the Masuyama 85° and almost as good Masuyama 65° performed on-axis compared to the others, they were my preferred contenders as they provided the most aesthetically rich observation of the celestial objects. William "Bill" Paolini has been actively involved in optics and amateur astronomy for 45 years, is author of the desk reference on astronomical eyepieces: Choosing and Using Astronomical Eyepieces which is part of the Patrick Moore Practical Astronomy Series published by Springer of New York, has published numerous product reviews on major online amateur astronomy boards, and volunteers with public tours at a famous vintage Clark refractor site. Bill's professional background is as an officer in the U.S. Air Force and as a computer scientist, holding a Bachelor’s degree in Computer Science and a Master of Science in Education. He has worked for the U.S. Department of Defense, the U.S. Department of Commerce, the Federal Trade Commission, the Federal Reserve, the World Bank, and a variety of commercial corporations in the information technology, information technology security, and telecommunications industries. Bill has been observing as an amateur astronomer since the mid-1960's, grinding mirrors for homemade Newtonian telescopes during the 1970's and eventually owning, using, and testing several hundreds of eyepieces in a wide variety of telescopes from achromatic and apochromatic refractors to Newtonian, Maksutov-Cassegrain, and Schmidt-Cassegrain designs. Today he enjoys observing from his suburban home west of Washington, D.C., where his primary amateur astronomy pursuits are lunar, planetary, bright nebula, open cluster, and globular cluster observing. This article is released into the public domain. Images not otherwise noted are © William Paolini 2017. All rights reserved. For permission to use images separate from the complete article, contact the author at wapaolini@hotmail.com. Highly interesting! But I am surprised that the Masuyamas show such relatively obvious off-axis astigmatism, according to the review. Has anyone tried them in longer focal ratio telescopes, such as f/12 maksutovs, f/15 refractors or the like? Very good review, Bill. The couple I've looked through have been very good on-axis, but at the end of the day, the Masuyamas are hindered on off-axis performance by the 5/3 element design. To some extent the off-axis distortion is lessened by the slower (longer) FL scopes but as ratnamaravind indicates, the design has certain inherent qualities. EP designers have to balance the TFOV with the distortion qualities on any EP design. They could have reduced the FOV and you just wouldn't see it but they chose to open the FOV and allow for some small edge distortion. Thanks for the excellent review Bill! Appreciate your time and effort bringing this together. Astigmatism is at times not readily seen, especially when the magnification is low. This is one of the things about "testing" vs. "using" eyepieces and why while some eyepieces may test less than perfectly in use they may be considered quite good. When testing one is critically examining performance using specific object types that accentuate the particular aberration most - like brighter stars for astigmatism. But when you focus most of your attention on the observation as opposed to any aberrations in the eyepiece, many times the aberrations go unnoticed. Why, in the end, each of us must judge for ourselves how impactful any test report results may or may not be for ourselves. For me I liked the Masuyamas a lot and if I had disposable income would add them to the stall because they have some really nice attributes like an uncommonly beautiful on-axis. I found the authority at which they rendered faintest star points most clearly as really something special. When I was on target with my favorite open clusters, the Double Cluster, I found it quite moving how authoritatively they showed some of the faintest stars in those clusters, which I am most familiar with. So with performance attributes like that, for me anyway, don;t care much about what is going on in the farther off-axis because what I am observing is dead center, where it should be for critical scrutiny. What are the Masuyama eyepieces going for these days? Are they similar to Televue EP's in price? Nagler better corrected off-axis as should be expected. Very nice review. I hope that some day there will be a 1.25" Masuyama 20 mm 85 degree . What do you think, will that happen? p.s. what is the field stop diameter of the 26 mm 85 degree eyepiece? The Masuyama performance sounds rather similar to the Meade QX 26mm I once had. Makes me wonder how well the Masuyama would perform in 'perceived contrast' if the name on the side was Meade. Beautifully written without chocking or breaking the article and execute the way that the reader preceived him/her self being with the author conducting review. Nothing wrong with Meade! I love Meade products!! I love ES products as well, but the Masuyama clearly bested it. Only way to tell though for your Meade would be for you to take a Meade and Masuyama, and turn them towards the Triffid Nebula and the Swan Nebula 10-20 times or more over 8-12 weeks, then see which one showed dark lanes and dark features best the vast majority if not all of the times (FYI, the latter being true with this test report; I never report a finding unless it is repeatable in 90% or more of the observations over many weeks, so recommend you do the same). 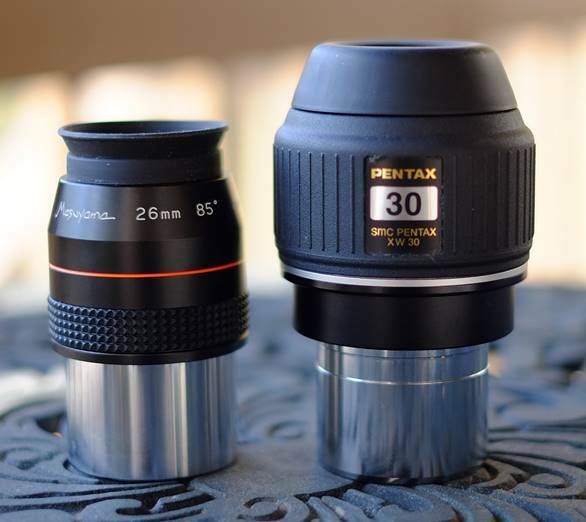 And if the two eyepieces are of similar form factor, then likely would need to take the eyepiece out of the focuser to look at it to determine which eyepiece you just did the observation with as you will find this happens a lot in testing (FYI, happened a lot for me with the 26 Masuyama vs the 25 ES 68 with 2" converter attached). Also recommend when you do that test that you record on voice recorder all field test results in real time as the observations occur, then when all done all the voice files can be reviewed and transcribed and assimilated to create a final written report. Let me know when you plan to do the Meade QX vs. Masuyama test...look forward to it! Having several of the original Masuyama's, I very much enjoyed your report Bill! Well if the guts of the Meade-branded units were the same - nice polish made by folks who enjoy a healthy margin on their products, and invest some of those spoils in superior design, superior materials, superior QA and QC, then I would expect the Meade-branded unit to review identically. Unfortunately several lines of China-made Meade eyepieces have been anything but that. I once received a Chinese made Meade 32mm Series 4000 Super Plossl *missing the eye lens*. Methinks Meade's declining reputation has been earned by misdeed and inconsistent sourcing and quality assurance, rather unfairly applied. Dunno about the QXs though. Not sure who the source is, GSO in Taiwan maybe? I have nothing against Meade (or Masuyama for that matter), I just don't like astigmatism. In fact, I'd go so far to say that obvious astigmatism starting relatively close to the center is a deal breaker for me. The 26mm Meade (and Orion Q70 brand) are very comfortable to use, and they have pretty good on axis sharpness. But the astigmatism was too much to bear, so I sold one and gave the other away. My guess is that they have more astigmatism than the Masuyama, so I'd think the comparison would require little more than a few seconds of time to figure out. Having said that, a double blind study would be fun if it were possible to exchange housings for Meade and Masuyama. We could then separate the effects of branding on perceptions from performance. And no need for the qualitative research--simple numbers would suffice. A small sample of observers, and we could conduct a signal detection analysis. ...a double blind study would be fun if it were possible to exchange housings for Meade and Masuyama. We could then separate the effects of branding on perceptions from performance. And no need for the qualitative research--simple numbers would suffice. A small sample of observers, and we could conduct a signal detection analysis. Unfortunately none of this would really tell you anything. The housing internals are integral to various performance parameters of an eyepiece (i.e., baffling, blackening, internal housing shapes, precision alignment of optics, etc.). And given that one cannot change the look of the eye lens or the feel of the ER, you can never really blind the experiment well enough unless you use folks who are complete newbies with no fore knowledge about the brands. And if you did use newbies then their observation skills are nothing so their results would be meaningless to the average amateur with a few years under their belts. And after all this trouble to properly blind the experiment, which means encasing all eyepieces in a generic form factor "over" their existing one, meaning defeating any superiority in eye guard ergonomics or eye relief one may have over another which people want to know, to get statistically valid results you would need quite a number of observers of various skills and health profiles and genders and scores of each eyepiece type to eliminate production variations. So really, any "proper" double blind experiment related to an eyepiece comparison would be quite a massive undertaking and cost quite a bit of time and money. And in the end you would have results for maybe one optical parameter like did it look brighter or did it look more contrasty (they would all have to be trained on what that means so they are reporting to a standard and not their impression btw). Basically you would get much less information for what would amount to hundreds of times the effort to conduct. I often hear folks chime about doing double-blind, but to do such a thing is really impossible without funding, especially if they would all have to evaluate the myriad of criteria readers of reviews want. A massive undertaking. And I know this may sound extreme, but you know what? If you do not do the double-blind study exactly correctly, taking all these precautions and using a statistically proper population and number of eyepieces, then all the results become worthless because of the bad design or inability to produce statistical significance. So for me, no thank you; qualitative field tests tell much more of a story. While I agree with many of your sentiments about the difficulty of conducting things, I think the possibility of double blind comparisons can be much more tractable than you argue. The comparisons in a double blind study are repeated measures--the same participant is subject to all treatments, treatments are independent (though sources of bias should be decreased as you point out), and that means so long as we have a reasonably representative sample, we do not need to control for age, gender, eye sight etc. Participants serve as their own controls. The statistical power of the test is not just determined by sample size, it is also critically determined by the size of the experimental effect. It would not be difficult to find 20-30 astronomers who would be interested in participating in such a test, and my seat of the pants power analysis suggest that this would probably be sufficient for basic analyses. Also, as for the biases, while eyepiece casing certainly will vary, I suspect a lot of your concerns could be allayed with careful choice of eyepieces. While it certainly would be difficult as a routine approach, it might be attempted in other ways. For example, it would be possible to devise a simple cloth barrier around an eyepiece, and procedures for participants to approach the eyepiece without inspecting it, only opening their eye once an experimenter has placed them in position for viewing. Following that protocol, it would not even be necessary to swap eyepiece cases. That design would be a standard "pepsi-challenge" . Two variations on the experiment would be one where no information is provided about the eyepieces, and a standard battery of questions could be devised--perceived contrast, ability to get the exit pupil, aberrations, and an overall score out of 10. It would also be possible to test whether people are able to correctly guess the make/model of the eyepieces, and this information can be statistically controlled, or participants dropped who have intimate knowledge of a particular eyepiece. I bet most people will not be able to accurately infer the focal length of the eyepiece, the brand, and I bet there's a good bit of inaccuracy in the size of the apparent field. A second variation could be to experimentally manipulate the eyepiece brand with the same protocol. Tell people that they are comparing X vs. Y, but do not specify which is which. That would allow testing for branding effects independent of performance effects. The best participants in that case would be 'intermediate' astronomers who have developed viewing skills and the ability to spot eyepiece aberrations, but who are not necessarily familiar with every eyepiece known to man. And all of that being said, we don't need to stop enjoying qualitative analysis like found in your excellent, and enjoyable review. The approaches are complementary, not competing. Having said all of that, I do agree with you about the difficulty of doing these tests compared with your approach. While you have obviously put a huge amount of time and effort into your comparisons and write up, that is relatively tractable as it is clearly a labor of love. Anyhow, one of these days I will put my money where my mouth is and do one of these kinds of tests. It should be a fun project that could be done with my local club as participants. If sufficiently clever, it may even be possible to get a publication out of it. Thank you Bill, very enlightning. I find it disconcerting that a lot of people only think that an eyepiece is only good if it has perfect off axis. The televue syndrome. Not that the ones with astigmatism off axis has better contrast and light transmission in the center axis where you frame the object. Also the same guy telling you that you don't know how to test eyepieces, over and over after you do one of your reports. Then he should do it, as he thinks it's so easy. It seems there's always several people want to shoot you down, to make a name for themselves. They can do it better but never do syndrom. Thanks Steve. And yes, a bunch of us when we talk always make your point that the people who seem so critical of testing at the same time never bother to do any testing to publish either. So true, if they want a different approach then they are more than welcome to put in all the effort doing it their way to share with us all. With set up time, observing time, break down time, logging observations, harmonizing observations with re-tests if an inconsistencies, then drafting and finalizing the article with photos it is easily 120 hours of solid work! So that's three weeks of full time 9-5 work! If I were to do a double-blind one correctly the setup and masking would take lots ATM time, then corralling and training lots of folks, etc., etc., would probably be easily 5-10 times the effort. I am not against the idea of a double-blind test, just that it would be a grand effort. So if my work rate is $50/hr and a double-blind would probably take me at least 600 hrs or more total, then who wants to fork over the estimate? That would be $30,000! I'm sure not putting that amount of effort into something for free!! First step in the process would be the test design and that would take at least 40 hrs to nail down into a proper paper that could then be distributed for a peer review. A lot of work! And yes...1000% agree on the off-axis is not to do-all and end-all. I know from my testing and experience that many of the eyepieces with stellar off-axis often are beat by others at the on-axis in one way or another. And many of the perfect off-axis wares seem to suffer from a less than friendly exit pupil design or poor eye relief. I've tried most all eyepieces out there...so far no one has come close to designing and executing what I would call a "perfect" eyepiece which would have 1) a very crisp and resolute on-axis with superb contrast and focus snap, 2) tight star points to the field stop with no visible lateral color, 3) completely uniformly dark background FOV, 4) very comfortable eye relief as measured from the top of the housing/eye guard, 5) no sensitivity to eye placement relative to either blackouts or impacts to how controlled the view is maintained, 6) minimal RD so FOV is close to orthoscopic, 7) less than the typical scatter around stars and planets that I see on most eyepieces (ZAOs are an example of how minimal scatter should be), and of course 8) zero unwanted light artifacts. Numbers 3, 5, 7 IMO are the things all makers seem to have the hardest with. Possibly. It definitely is doable, but my biggest point is that it will take a lot of work to put together, and time is money! Some of the most obvious confounding variables to think about are of course: atmosphere, base equipment, test equipment, and the testers. Any tests would have to be repeated quite a number of times to help mitigate variances in seeing. Easy enough to do when one person is doing it all but to get a corral of equipment and people to repeat a single observational test 10 times or more over several evenings would be quite an undertaking, especially when the total number of things one looks for in testing an eyepiece is a lot (Scatter FC, RD, Astig, Lateral Color, AMD, Multiple Light Artifacts, Star Color Rendering, dimmest star performance, dimmest extended object performance, contrast tests, just to name a few). Then think about how if one is going through all this effort with as you say 25 people, should probably have 2 scopes to make more efficient use of time which means would need to get bench test reports on the two optics to ensure equivalence and also verify each is completely thermally acclimated the same (which means FLIRs and such to take readings). Now with these 25 people, they would all have to be trained on how and what to look for with each test. So can leave nothing up to assumption that they will know how to look for say astigmatism. Everyone must conduct the test uniformly so would have all that training time to show them what it looks like, how to perform it, and make sure they are all conducting the test uniformly. Would also be helpful to have a recent eye sight exam for each person and ensure they are hydrated well, rested well, and uniformly acclimated to dark adaptation before the experiment begins. With the test equipment, if we are comparing 2 different eyepieces let's say, we do need more than just one of each because there are production differences so we would need several of each. Now statistically we would probably need 20 or so of each. But let's shortcut and get say 5 of each. So that is 10 eyepieces total, of the two brands being tested. OK...if we do an off-axis test for astigmatism, then each person needs to do that test 10 times because there are 10 eyepieces. Of course we will need to do multiple tests to ensure it is not a one-off so I like repeating a test at least 10 times, so that means each person will test for astigmatism 100 times total. Then same with all the other tests. With all these eyepieces also means we will have to mask them all, and also get a separate bunch of people to assist the testers and record their observations. So if we have 2 scopes then would need 2 staff to dedicate to taking their observation notes and 2 staff to dedicate to running the test. Remember that those running the test can not know anything about the eyepieces since they need to be blinded as well. So a separate group of staff would have to prepare all the masking of the equipment and setting equipment out for the blinded staff to take to give to the test subjects. Now in masking the equipment, this becomes a most difficult task IMO. Since we do want real amateur astronomers and not newbies, they will know lots of stuff about eyepiece brandings. So basically would really have to completely encase an eyepiece in some sort of enclosure that only shows a peep hole onto the eye lens and nothing else. No part of the upper housing or eye guard can be visible. And of course all eye lens holes in the mask would have to be the same. Would even have to ensure that the height of the eye lens above the diagonal was uniform as cannot have people seeing one shrouded eyepiece is taller than another. So they can see nothing that will allow them to form an opinion that let's them think they can identify any differences physically. We would also have to ensure that none of the testers talked to each other during the test or afterwards until all tests were completed. Now we all know that even if one person is doing all the testing that it can never be done in a single evening. So given all these folks and all this equipment and all this prep to be done, even with just 2 brands of eyepieces to compare we'd have to corral all these folks out for extended viewing on many many evenings. Given the weather and peoples work schedules and such how long do you think it would take for this double blind? I'm thinking many months jsut to get all these folks out in the field maybe 4 or 5 times. ps - thinking about this more, since going to all this trouble, I would tell the testers they are testing 3 eyepieces. However, I would just substitute one of the brands giving it to them twice and just saying it is a 3rd brand. Reason is I would want to see how much variation they reported between the two identical eyepieces they thought were different. In a way, that would be a control to highlight the existence of any unknown/unanticipated confounding variables or possible some flaw in the base design of the experiment. Excellent review Bill - thank you. Do you think the contrast differences between the Masuyama and ES eyepieces is simply down to coating quality, or the optical design, or a combination of both? Interesting, the colour of the coatings in these eyepieces. Similar to the old Ultima Celestron eyepieces, or some Zeiss optics. Whereas most optical components we see today from China or Taiwan seem to have the uniform greenish coating reflections. I wonder if it's an indication of the number or thickness of the multicoatings? Can I translate it into Italian and publish on my website with all the reference ?